Description: 2-Bedroom/2.5-Bath Unit in lovely Four-Plex on quiet tree-lined street. Main is open-floor plan, spacious and bright, updated with hardwood floors and crown mouldings. Cozy fireplace in living/dining rooms and lovely powder room, efficient pantry. Stairway opens to 2 nice bedrooms plus 2 more baths. Master is large with a lot of light. 2nd bedroom features patio and great garden outlook. Garage at rear offers security and storage. One of the best blocks in the City-Hall Area. 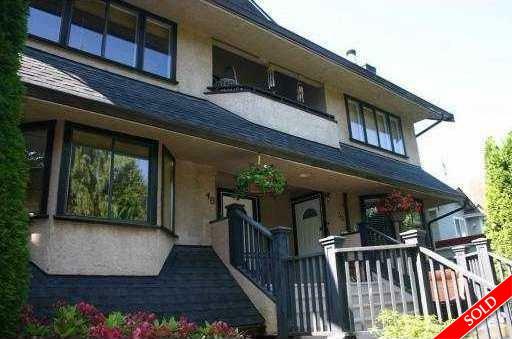 Close to shopping, parks, school and Community Centre. PUBLIC OPEN HOUSE: Sunday December 13th, 1-3 PM.